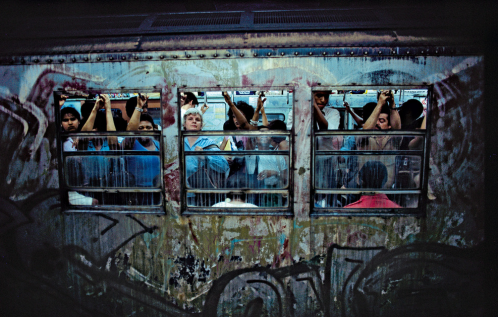 Democratic and radically public – the subway provides Bruce Davidson with the ideal setting for his long-term urban reports and is therefore the title of the current exhibition at C/O Berlin. In this rolling prison everyone is visible to everyone. The passengers respond very differently to this exposed setting. While some hide and duck away timidly in the crowd, others pose unabashed and use the carriages and stations as stages for their self-portrayal. Even though Bruce Davidson does not photograph from a hidden perspective and usually respectfully asks for permission, nothing is staged in his pictures, every situation is authentic. The photographer is always a passenger, observing the scenario – hunting for the “decisive moment”. This creates a unique tension in his pictures – the persons portraited appear full of human dignity even in this inhumane, ruthless world. The photographer Bruce Davidson boards the train, immerses himself in the raging, rattling hustle and bustle of the city and portraits the passengers between uniformity and diversity, anonymity and intimacy, depression and inspiration. Whether lovers, musicians, homeless people, tourists or business people – in the subway and its passengers he finds the perfect metaphor for life in the metropolis with its aggression and ugliness, its hope and humanity.